Redevelopment of the Robb College Student Accommodation at the University of New England (UNE) will go ahead, despite architects’ campaign to get the building heritage-listed. An architect has not officially been announced, but CSArchitects seem to be in the running, having recently worked on another student accommodation project at UNE. In an attempt to stop the demolition and redevelopment of Robb College, a group of leading Australian architects wrote a letter to NSW heritage minister Gabrielle Upton, urging for the building to be heritage-listed. They argued that the building is significant due to its status as one of the first modernist University colleges built outside of Sydney. Other arguments against the redevelopment include the fact that the college is an example of the early work of architect Michael Dysart, who designed the building at age 24, and that it will cost more money to demolish and redevelop the building than to restore it. Signatories of the letter include Dysart himself, as well as esteemed heritage architect Clive Lucas, who was an original founding partner of Clive Lucas, Stapleton & Partners. However, it was announced in December 2017 that Robb College would not be added to the NSW State Heritage Register, and that the redevelopment will go ahead. According to UNE, the original dining hall will be retained, and some basalt from the original building will be used in the new build. An architect for the new building has not been officially announced, but CSArchitects appears to be in the running. 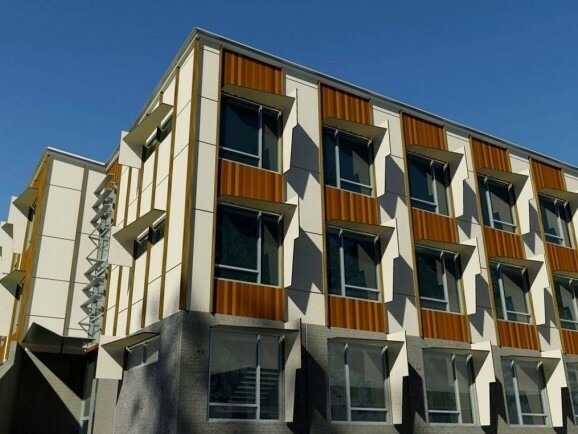 “The project is ideally suited to be delivered and based on a modular building system,” says the firm, which recently delivered the university’s modular student accommodation at Wright College. “The design will maintain the integrity of the existing built form, complementing the existing Dining Hall by using similar materials and colour. The proposed three accommodation clusters will retain their connection with the Dining Hall and the main central courtyard, and the building form, scale and massing will be in context with existing building footprints with interconnecting covered walkways.